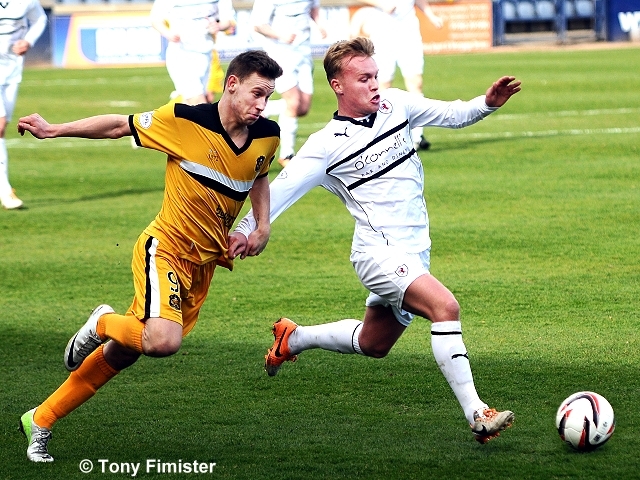 Raith’s returning Ramsden’s Cup heroes bumped back to earth with a 3-1 home defeat, grounded by an enterprising Dumbarton side at Starks Park. The visitors took control of the match early with two first-half goals. 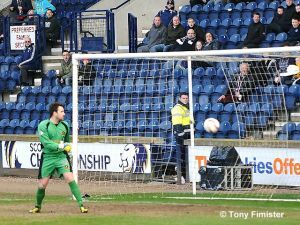 Despite a second-half rally from the home side, Raith’s chances of taking points from the match disappeared down the tunnel with Dougie Hill, sent off with fifteen minutes to go. 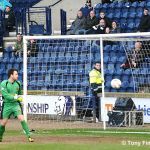 Whilst most observers will assume a Cup hangover was to blame for Raith’s sluggish performance today, more truth lies in the absence of three of the team’s four starting midfielders. 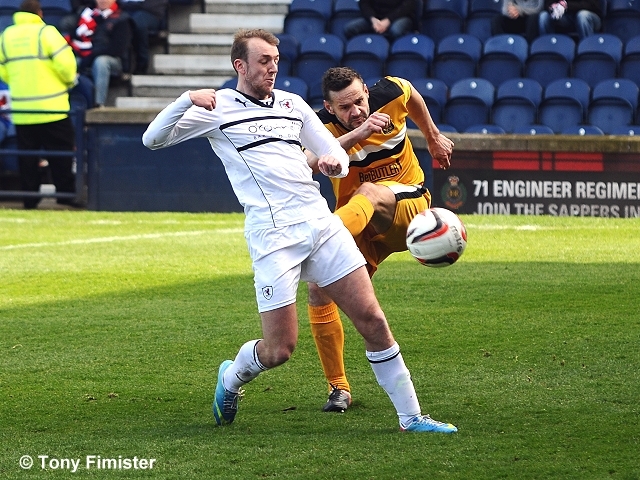 With Kevin Moon, Joe Cardle, and Liam Fox all missing through suspension, Dumbarton’s mobile midfield had freedom to pick passes from the game’s first whistle, with Raith only establishing a foothold in the game following half-time. In truth, today’s match should have been something of a coronation – national cup silverware placed in the Starks Park trophy-cabinet for the first time in twenty years, with the huge Kirkcaldy support floating back from Easter Road with celebrations and John Baird’s 117th minute winner etched in the memory for years to come. While the team can be forgiven understandable excesses in the aftermath of the wonderful scenes last Sunday, there is no doubt still work to do to ensure Championship survival – after all, next season’s league encounters with Rangers, Hearts, and perhaps Dunfermline also promise to make it a campaign to remember. 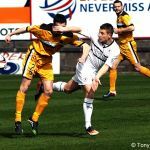 Dumbarton, comfortably in mid-table and with the highest goals-scored figure in the Division, were in no mood to allow Raith a smooth re-entry. From the off, the ‘Sons were bright and lively, testing Raith centre-halves Watson and Hill with movement and forward-running. 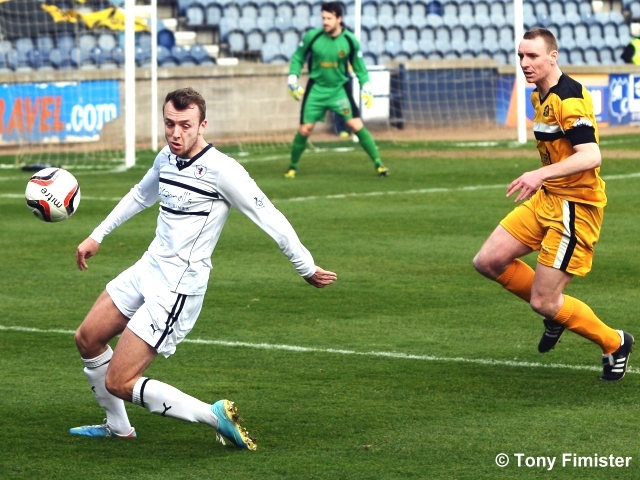 Although top-scorer Chris Kane started on the bench, Mitchell Meginson and Colin Nish upfront were ably supported by Kirkpatrick and Turner in the centre of midfield. 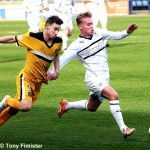 Having scored six in three games against Raith already this season, Dumbarton set their stall out to attack regularly and often. Linton’s early shot was well held by Robinson, while Fleming nearly capitalised after Hill was short with a back header. A poignant moment was observed early on by the home support – a minute’s applause for former Raith defender Ronnie Coyle, fondly remembered by supporters and staff alike at Starks Park. 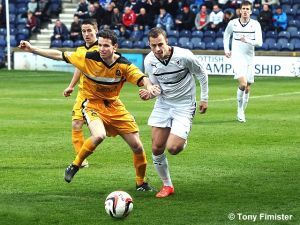 Although Raith won their share of tackles, Dumbarton’s well-drilled midfield created several chances as the first-half progressed. 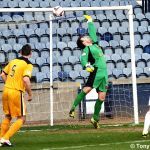 Fleming shot weakly following a Graham knock-down, Kirkpatrick’s movement twice gave time to arrow passes inside the home full-backs, and Fleming muscled his way between Thomson and Watson to fire at Robinson – the Raith keeper saving well. After quarter of an hour, Kirkpatrick was allowed to run from deep, creating a shooting opportunity only to be blocked by a well-timed sliding challenge from Hill. Graham’s header from the resultant corner was shepherded off the line by Booth, manning the far post. 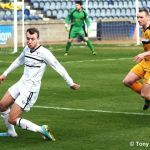 Calum Elliot, deputising in central midfield, freed Anderson to run at ‘Sons full-back Linton, drawing a foul in a dangerous position. 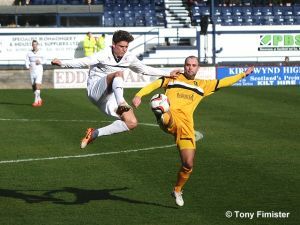 While Booth’s free-kick was blocked away for a corner by keeper Ewings, Raith’s best chance of the half came from the next attack – Kirkpatrick deceived by the swirling wind, flashing a header against his own cross-bar. 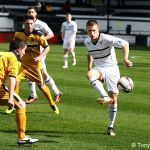 Given the volume of possession Dumbarton were enjoying, it was no surprise when Raith conceded in twenty-three minutes – Gilhaneyshooting home after Kirkpatrick created the opening following a well-worked free-kick. Within five minutes, the margin was two. 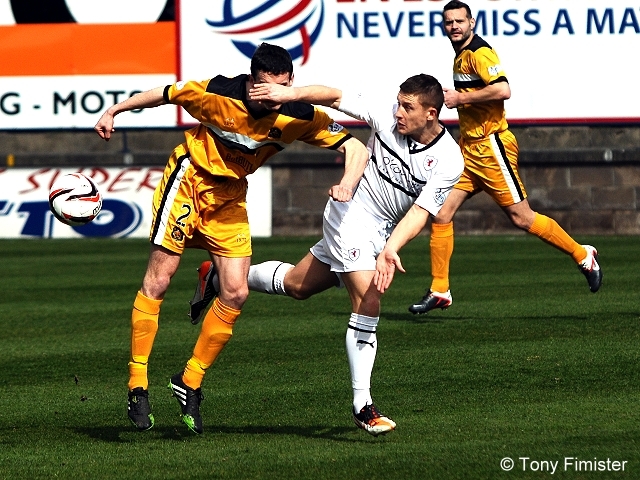 Following a Gordon Smith shot which was deflected agonisingly wide, Dumbarton attacked and doubled their advantage. Megginson picked the ball up twenty-five yards from goal, shielded well from Elliot’s tackle, and with a change of pace found space between Hill and Anderson’s attempted challenges to fire high beyond Robinson. With a sharp central midfield pairing, Dumbarton were picking up the loose balls from knock-downs and tackles in the Raith half of the field. 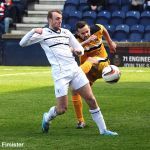 Without their usual midfield fulcrum, Raith’s replacement midfield were unable to battle for the unglamourous work of tackling and clearing their lines. 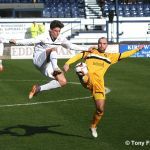 The Raith back four were winning their fair share of challenges, but the visiting midfield were sweeping forward from the scraps provided to them. 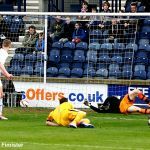 What looked like an attacking side on paper – Raith lined up with Spence and Baird as a front-two, with Elliot and Smith located in midfield – looked from early on like it lacked an engine-room. Both Fox and Moon make tackles, sweep up possession, and distribute early to the flanks to clear danger, while today’s unfamiliar midfield quartet were unable to exert authority over the central third. Callachan was sent on at half-time, and dispatched straight into the trenches – manager Grant Murray obviously realising that without firm foundations, his side were unlikely to build any kind of attacking platform. One of the other main factors in today’s fixture was the blustery conditions. In excellent weather for surfers and for wind turbines, cohesive midfield possession and quick passing was a struggle. 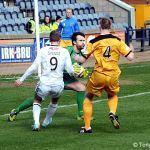 The second half began with Gilhaney’s cross deceiving Watson, who’s control inadvertently used both an arm and a leg – referee Charleston saw the offence, but deemed the handball unavoidable, waving away Dumbarton penalty claims. 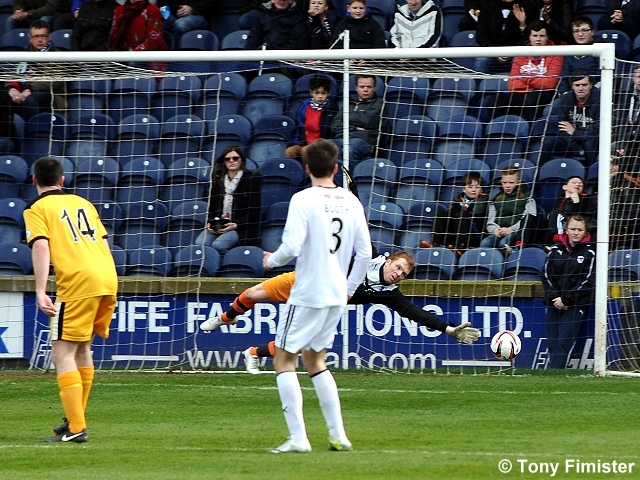 Within five minutes, the match was put beyond Raith’s reach with a slack defensive goal. 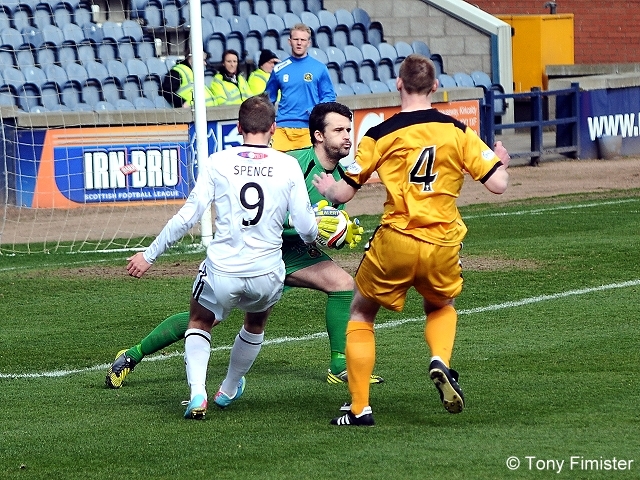 Gilhaney was allowed space to come in off his flank to hit a low cross-shot to Robinson’s right – with the goal-keeper moving to one side, Nish deflected the ball just inside the near post for Dumbarton’s third. In the minutes that followed, further chances fell to the visitors – Fleming’s excellent control of a high ball left Watson wrong-footed, allowing Megginson to blast high and just wide of Robinson’s near post. After Baird’s neat through ball was intercepted in midfield, the languid Kirkpatrick weaved toward goal, free-ing space for Nish to thump his shot up into the away support. 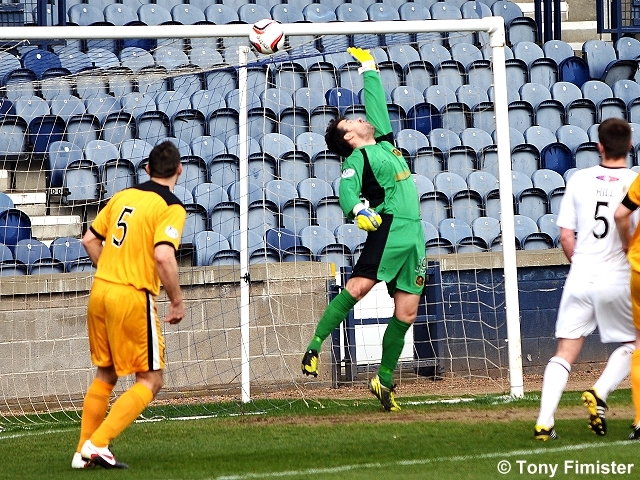 Dumbarton’s travelling support – three goals to the good – cheered every move. A disappointing crowd of only 1602 had been on the home side’s backs since half-time – memories of the previous weekend obviously having been consigned to the mental history books with a speed more appropriate for fans who enjoy regular trophy success. Although the manner of today’s performance was obviously below-par, Raith’s players and coaching staff had to provide their own encouragement. While the home support were quick to categorise the players as exhausted by last week’s excitement, they themselves seemed disgruntled by the return to the grind of league football. The mood lifted with a delightful curling shot from Smith on the hour. Following Graham’s partial clearance from a Mullen corner, Smith transferred the ball to his right foot, and found Ewing’s far left-corner from the edge of the area. 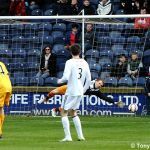 The one moment of genuine Raith quality lifted the noise levels in Starks Park, and with that, Raith had by far their best spell of the match, in their pursuit of a second. Another Mullen cross was gratefully gathered by Ewings with Spence and Smith hovering, and a driven Elliot centre just escaped Spence’s outstretched leg as Raith generated real pressure, with four corners in as many minutes. 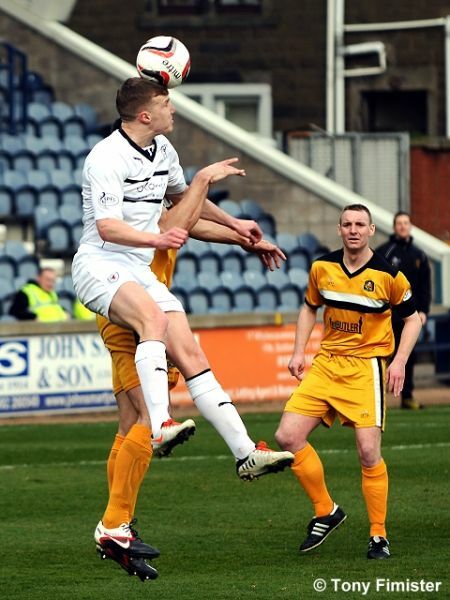 Referee Charleston again turned away hand-ball claims, this time Dumbarton’s McLaughlin seeming to nudge a clearance away with more than just a hefty boot. 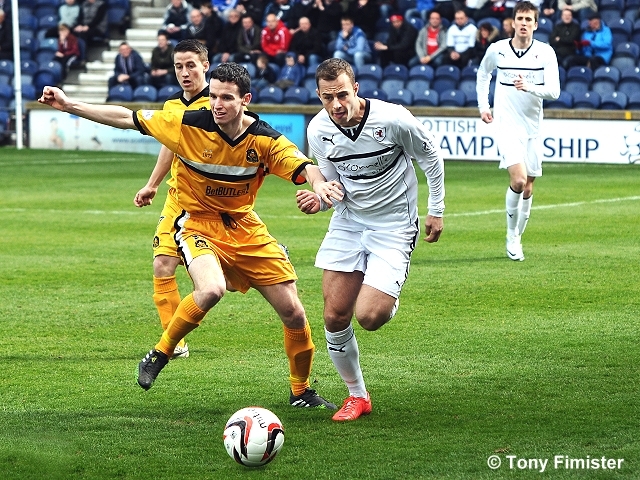 If Raith had nicked a second in the moments following Smith’s goal, the home side may indeed have stolen a point; however, Dumbarton’s ship steadied with the introduction of the tidy Agnew into midfield, and Raith were unable to create the clear-cut chance needed to give the game life in its closing stages. 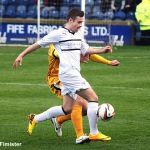 The final meaningful action of a disappointing afternoon saw Hill red-carded for a deliberate tug on Fleming’s shoulder as the Dumbarton striker escaped toward goal. Having cleared one long through ball, Hill was caught flat-footed as Fleming headed over him and chased his own through ball – although the visiting front-man made the most of the contact, the red card was justified. The match petered out in the final stages – the high wind giving both sides difficulty in creating any fluid possession through midfield. 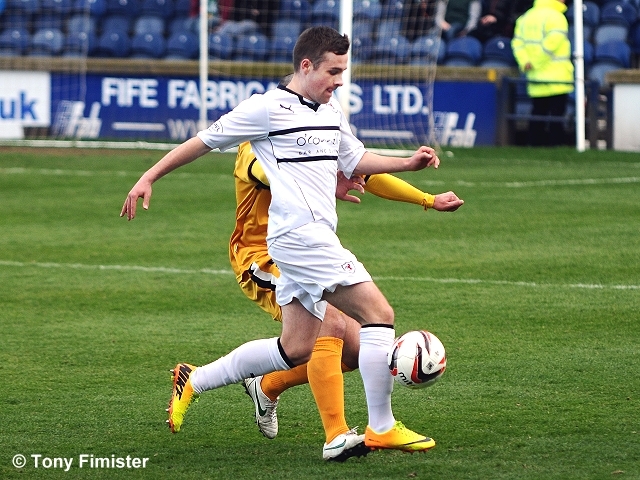 McGinn’s booking for clattering the hard-working Smith drew ironic cheers from the home support, but by then the three points were in the bag for the visitors. 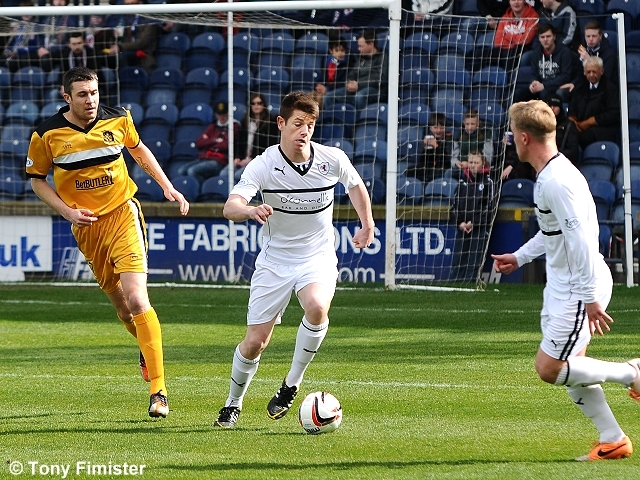 With the visit of mid-table Queen of the South on Tuesday, and Raith’s midfield pairing and the entertaining Cardle available for selection after their suspensions, Grant Murray will be hoping Championship status can be secured with two wins from Raith’s final two home league games – ensuring Raith’s 2013/14 season is remembered for a thrilling cup final win, and not the bitter aftertaste of relegation. Sons break and Hill great last gasp tackle to prevent the shot. corner and Booth clears off the line. Nish nearly makes it 3...Robinson does enough to prevent a clean connection. 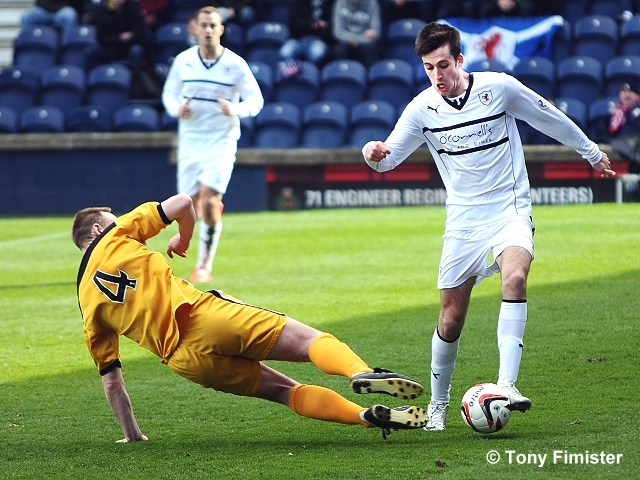 RAITH: Robinson Thomson Watson Hill Booth Mullen Smith Spence Anderson Baird Elliot. Subs: Callachan Donaldson Ellis Laidlaw Vaughan Matthews Bates. 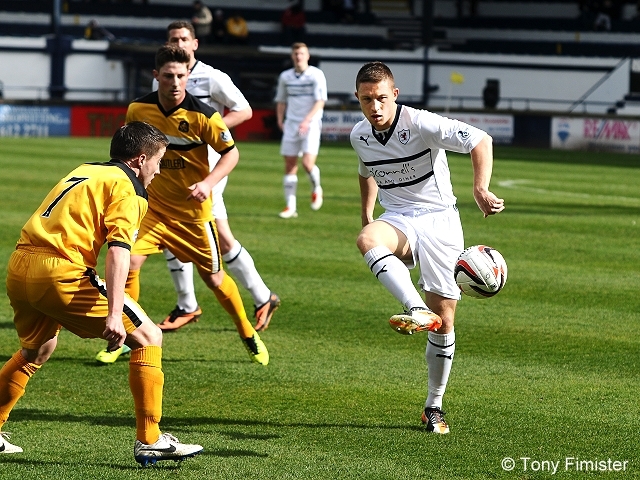 DUMBARTON: Ewings McGinn Graham McLaughlin Linton Gilhaney Flening Turner Kirkpatrick Nish Megginson. Subs: Grindlay Smith Agnew McDougall Prunty Kane Murray.